Dedicated to educating people regarding the Post Traumatic Stress Disorder (PTSD) impacting so many of our brave veterans, and the secondary PTSD impacting so many of their caregivers. Trailers may be rented to serve as rolling billboards designed to educate people about the 22 suicides per day caused by PTSD. Secondary PTSD may affect anyone who cares for a veteran suffering from PTSD. Spouses, family members and friends all need education and support from one another in order to help themselves and to provide the best care possible for a loved one suffering from PTSD. Our country has asked these brave veterans, many of whom were volunteers, to do incredible and unsettling things for us so we may live our lives in FREEDOM. 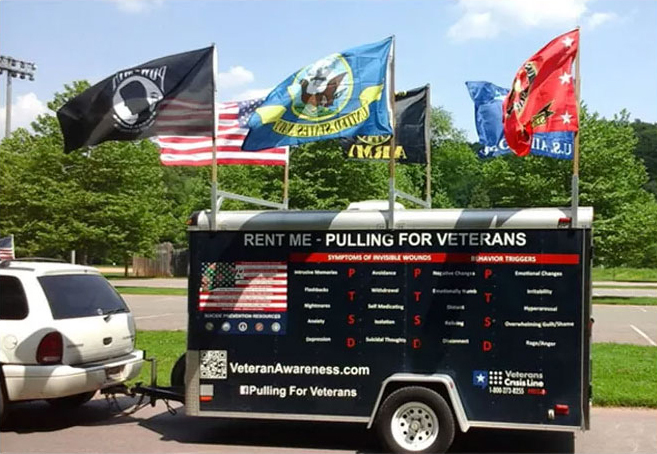 Pulling for Veterans is looking for 1500 veterans who own small businesses capable of housing three trailers. A 4’ x 8’ trailer may be rented for $1.00 per hour, a 5’ x 10’ trailer may be rented for $1.50 per hour, a 6’ x 12’ trailer may be rented for $2.00 per hour. 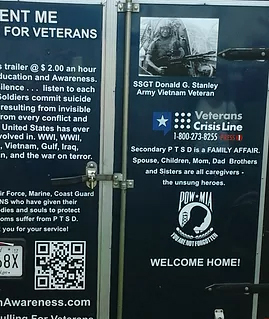 I WANT TO RENT A TRAILER & HELP VETERANS WITH PTSD! 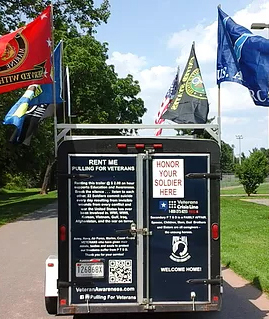 Pulling for Veterans also offers a unique opportunity to not only provide assistance to deserving veterans, but also honor your soldier with a trailer featuring his or her name and photo as a rolling memorial.